Special Alert! Archives - Page 5 of 5 - Oy Vegan! 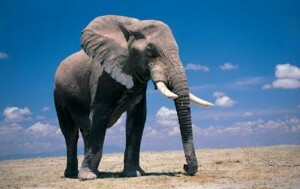 By jamie on November 24, 2011 in Reflections, Special Alert! In Canada, we already cel­e­brated our Thanks­giv­ing in Octo­ber. How­ever, I want to take this oppor­tu­nity to wish all my south­ern neigh­bours a Happy Thanks­giv­ing… or should I say Thanksliv­ing. While Amer­i­cans gather together with fam­ily and friends on this day of thanks and boun­teous food, I think it’s impor­tant to con­sider just where this food came from. The first thing peo­ple asso­ciate with Thanks­giv­ing is, in most cases, Turkey. In fact, you’ve prob­a­bly heard or even said “Happy Turkey Day!” your­self at some point. Turkeys, in my expe­ri­ence, are extremely friendly and intel­li­gent birds. I hap­pened to meet some on my visit to Cedar Row Farm Sanc­tu­ary last year. They came right up to me with warm greet­ings when I arrived. I was bowled over by how friendly and socia­ble they were. Not just with each other but with people! After our visit, I was touched by my expe­ri­ence with the turkeys and dis­turbed that the the word turkey is almost syn­ony­mous with food on Thanks­giv­ing. 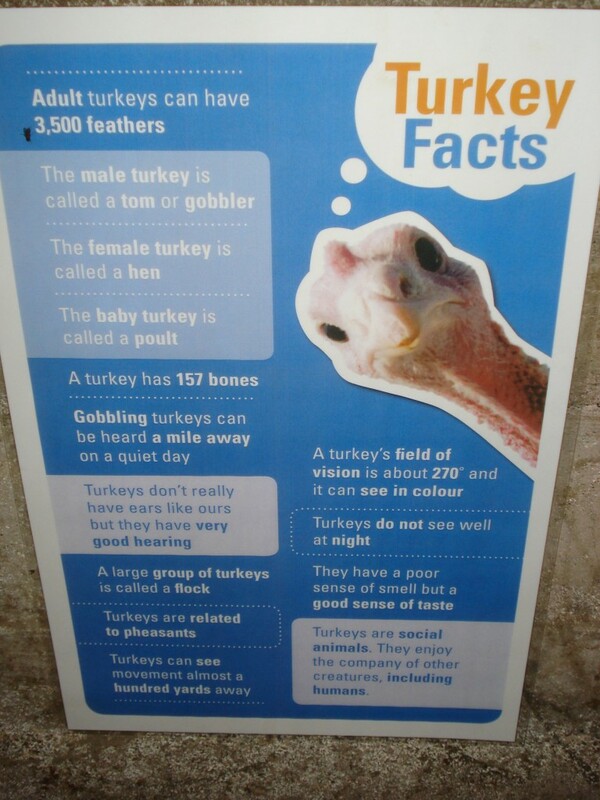 If only peo­ple knew more about turkeys then they might not be so quick to eat them on Thanksgiving. Thank­fully, every year Farm Sanc­tu­ary cel­e­brates a turkey-free Thanks­giv­ing feast and encour­ages peo­ple to Adopt-A-Turkey. Through this pro­gram peo­ple can save a turkey by spon­sor­ing it with a one time dona­tion of $30. Farm Sanc­tu­ary has res­cued over 1,000 turkeys since 1996. This pro­gram also seeks to edu­cate peo­ple on the sit­u­a­tion fac­ing turkeys today such as fac­tory farm­ing con­di­tions and facts about turkeys as a species. Between 1965 and 2000, the weight of the aver­age turkey raised for food in the U.S. increased by 57 per­cent, from an aver­age of 18 pounds to an aver­age of 28.2 pounds, pre­vent­ing commercially-raised turkeys from per­form­ing their nat­ural behav­iors and caus­ing them to suf­fer from crip­pling foot and leg problems. Wild turkeys, who weigh between 8–18 pounds, are able to fly up to 55 miles an hour, but turkeys raised for meat on fac­tory farms are so large they can’t even perch. When turkeys arrive at Farm Sanctuary’s shel­ters, they attempt to perch and even fly until they are too large to do so. Indus­trial turkeys’ unnat­ural weight causes many health prob­lems, includ­ing heart dis­ease, heart attack, and arthri­tis, at as young as one month of age. 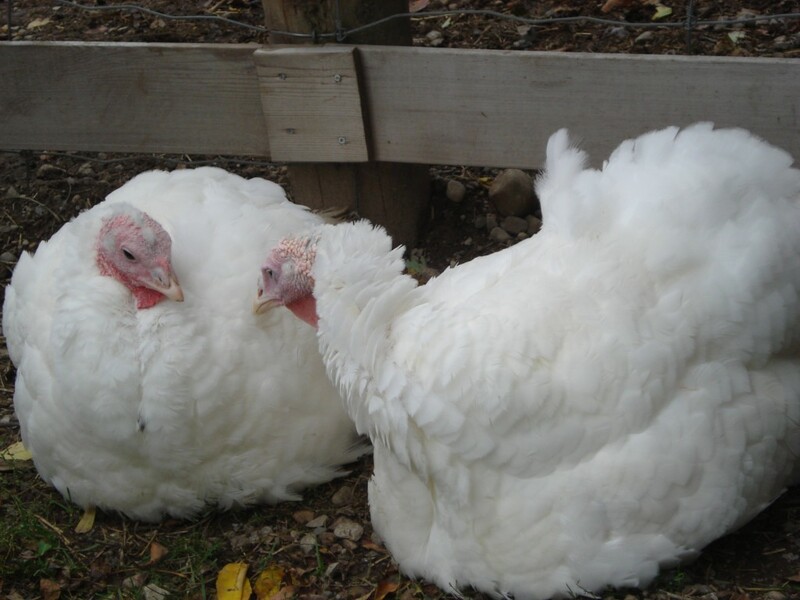 At our sanc­tu­ar­ies, we have to feed our turkeys res­cued from indus­trial farms a restricted diet to ensure that they will live long, healthy lives, oth­er­wise they will gain even more weight than the aver­ages listed previously. Turkeys rec­og­nize each other by their unique voices. Researchers have iden­ti­fied nearly 30 dis­tinct vocal­iza­tions in wild turkeys. Like dogs and cats, turkeys are highly intel­li­gent and emo­tional ani­mals who show great affec­tion to oth­ers and form strong social bonds with other turkeys in their flock that last a lifetime. Turkeys have excel­lent geog­ra­phy skills and can learn the spe­cific details of an area of more than 1,000 acres. On fac­tory farms, turkeys fre­quently have the ends of their beaks and toes cut off with­out anes­the­sia — prac­tices know as debeaking and detoe­ing — to pre­vent them from injur­ing one another as they are crowded by the thou­sands into dark, filthy warehouses. Com­pletely unlike their wild ances­tors not only in terms of physique but also in hue, most com­mer­cial turkeys are totally white — the nat­ural bronze color selec­tively bred out of them to elim­i­nate uneven pig­ment col­orations — because of con­sumer pref­er­ence for even flesh tones. Cater­ing to con­sumer pref­er­ences for “white meat,” the indus­try has selec­tively bred turkeys to have abnor­mally large breasts. This anatom­i­cal manip­u­la­tion makes it impos­si­ble for male turkeys to nat­u­rally mate with females, elim­i­nat­ing these birds’ abil­ity to repro­duce with­out arti­fi­cial insem­i­na­tion. As a result, arti­fi­cial insem­i­na­tion is now the sole means of repro­duc­tion on fac­tory farms, where breeder birds are con­fined for months on end. Turkeys, like all ani­mals, love life and want noth­ing more than to live free from fear and pain. Yet turkeys, along with other poul­try, are not pro­tected by the fed­eral Humane Slaugh­ter Act. Every year, more than 46 mil­lion turkeys are killed, fre­quently with­out first being stunned, for Thanks­giv­ing dinners. For earth and animal-friendly turkey sub­sti­tutes for your Thanks­giv­ing table click here! When I went to visit Cedar Row Farm Sanc­tu­ary this past Octo­ber, I was sad­dened to find out that the turkeys that had whole­heart­edly greeted me in 2010 had passed. Turkeys are bred to have large breasts as this is the part of them that is in high­est demand for non-veggies. As a result, turkeys that are lucky enough to live out their lives end up hav­ing heart prob­lems among other issues. I was told that some­thing called the “flip” hap­pens. The “flip” is when their breasts become too large and they flip over on to them and die. When I heard this was the fate of my beau­ti­ful friends, I was truly upset. I had really looked for­ward to see­ing them again. 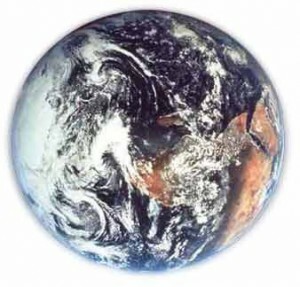 So on this day of thanks, let’s take a sec­ond and be thank­ful for all the crea­tures on this planet. 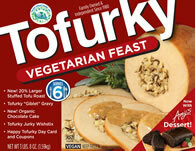 Let’s instead eat some Tofurky with mush­room gravy while we hon­our all those we are grate­ful for. Here’s to the turkeys! What an amaz­ing bird. If you get a chance to inter­act or hang out with one, I would highly rec­om­mend it. Happy Thanksliv­ing! By jamie on November 22, 2011 in Special Alert! Check out this cool arti­cle from Huff­in­g­ton Post on how veg­an­ism has some styl­ish new spokes­peo­ple. Thank Hashem! By jared on November 11, 2011 in Special Alert! On Octo­ber 25th 2011 the Toronto City Coun­cil voted 31 to 4 in favour of send­ing Iringa, Toka & Thika, the 3 remain­ing ele­phants at the Toronto Zoo, to the PAWS Sanc­tu­ary in Cal­i­for­nia. This place is awesome! It is now Nov 11th!? What is the hold up? Bob Barker has even offered to cover all the costs to trans­port these poor guys to California. Toronto is a great place to live, if you are a human. I don’t think the ele­phants will appre­ci­ate another snowy win­ter the way we do, so let’s set them free and give them a bet­ter life. By jamie on November 1, 2011 in Special Alert! 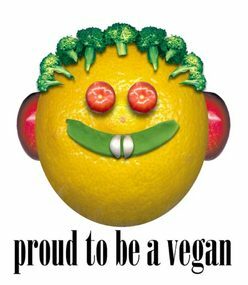 It has been 68 years since The Vegan Soci­ety was formed and the term “vegan” was coined in Hol­born, Lon­don. We’re sure glad it hap­pened! 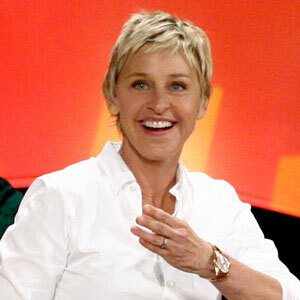 Other name ideas included “dairy­ban”, “vitan”, “benevore”, “sani­vore” and “beau­mangeur”. Luck­ily, the word “vegan” was cho­sen by Don­ald Wat­son to describe those who not only abstained from eat­ing meat, but also did not con­sume any ani­mal prod­ucts such as eggs, milk, or cheese. If he hadn’t decided on that name on Novem­ber 1st 1944, today I might be say­ing Happy World beau­manguer day! or Happy sani­vore day! 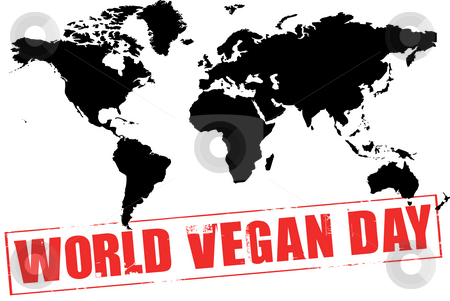 Regard­less of the name, it is the idea and the lifestyle that we cel­e­brate today and lucky for us, today is just the kick off for World Vegan month! Here’s what fel­low veg­ans around the world are doing to celebrate! 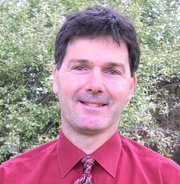 In Toronto, the TVA (Toronto Veg­e­tar­ian Asso­ci­a­tion) is gear­ing up for some awe­some events includ­ing a visit from the leg­endary Dr. Neal Barnard on Nov 10th. So Happy World Vegan day! and Happy World Vegan month! Let’s spread the mes­sage, spread the love and cel­e­brate this com­pas­sion­ate and pas­sion­ate lifestyle. Special Alert! 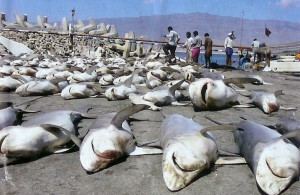 TORONTO BANS SHARK FINS!!! By jamie on October 25, 2011 in Special Alert! Wooooohooooo! We did it Toronto! 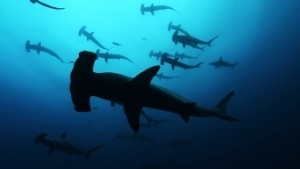 We just took a great step towards pro­tect­ing our sharks. Thank Hashem! It was a lively and pas­sion­ate debate at Toronto City Coun­cil today. 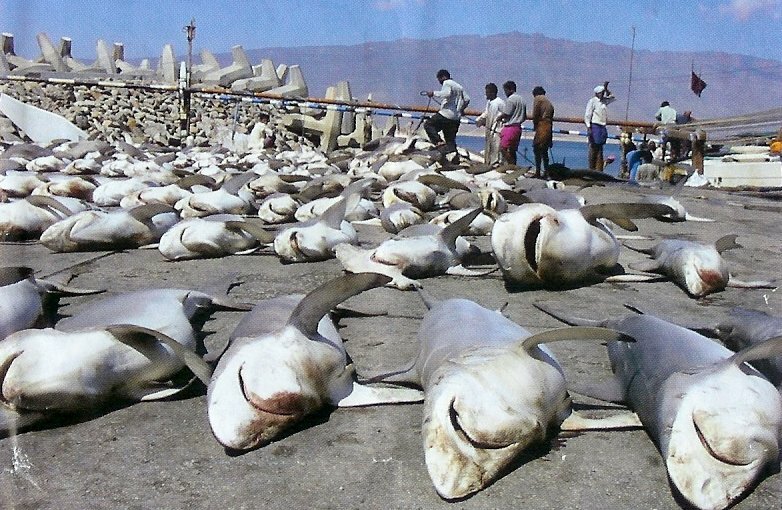 In the end, the coun­sel­lors voted for the ban of shark fins in Toronto: 38–4. Coun­sel­lors R. Ford, Mam­moliti, Shiner and Holy­day opposed the ban. Read more about it here. The whole room erupted in applause as the motion passed. This is a great day for Toronto and a great day for sharks. The next step is to take this coun­try wide and then world wide! Who’s with me?! 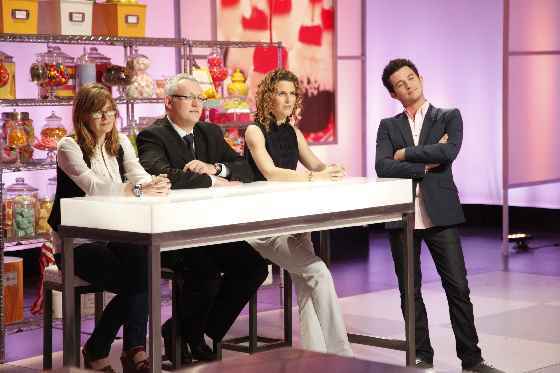 Vegan wins Food Network’s Cupcake Wars! By jamie on October 21, 2011 in Special Alert! Check this out! Shout out to quarrygirl.com! 100 year old man finishes Toronto Waterfront Marathon! Guess what? He’s Vegetarian! By jamie on October 19, 2011 in Special Alert! 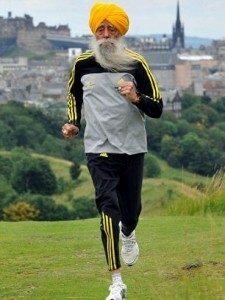 Cen­te­nar­ian Fauja Singh ran the Toronto Water­front Marathon on Sun­day. He’s also veg­e­tar­ian. We’re not surprised. The UN wants the world to go Vegan!! By jamie on October 17, 2011 in Special Alert! UN urges global move towards meat and dairy-free diet!!! Read the Guardian arti­cle. Shout-out to Bar­bara for link­ing me to this. Special Alert! 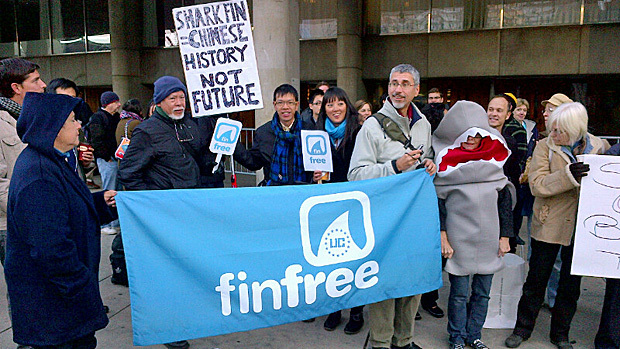 Sign this petition for a fin free Toronto!!! By jamie on October 15, 2011 in Special Alert! Great news! On Thurs­day Octo­ber 13th, I went down to city hall to show my sup­port for the pro­posed shark fin ban in Toronto which was brought before the licens­ing and stan­dards committee. I’m happy to report there was a huge turnout of shark lovers. 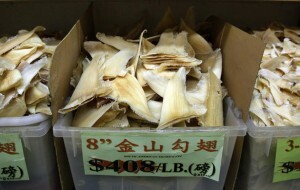 We def­i­nitely out­num­bered the angry shark fin soup mer­chants! About 40–50 peo­ple spoke to the com­mit­tee in sup­port of the ban. Among them was Rob Stew­art maker of the crit­i­cally acclaimed doc­u­men­tary Shark­wa­ter, win­ner of 31 inter­na­tional awards and Les Stroud of hit TV show Sur­vivor­man. Christo­pher Chin from COARE flew in from Cal­i­for­nia, where they just passed a shark fin ban effec­tive Jan­u­ary of next year, to speak to the com­mit­tee. One of the high­lights of the day came when Julie Ander­son of United Con­ser­va­tion­ists and Shark Angels showed select footage of her work with sharks which included video of sharks being finned, and was chas­tised by the speaker for show­ing such graphic imagery. One of the coun­sel­lors yelled out dra­mat­i­cally that she felt nauseous. The good news is that the com­mit­tee voted unan­i­mously to bring the issue before city coun­cil later in the month. Word on the street right now is it will take place Octo­ber 24th 2011. A small vic­tory but a step in the right direction! In the mean­time, more sig­na­tures are needed to show support!! Please take a sec­ond and sign the peti­tion to sup­port the ban of the pos­ses­sion, sale, and con­sump­tion of shark fin prod­ucts in Toronto! Oy Vegan wants to shout out every­one who came to sup­port on Thurs­day AND a HUGE shout out to Coun­cil­lor Kristyn Wong-Tam and Coun­cil­lor Glenn De Baere­maeker for all the work they have done!! !